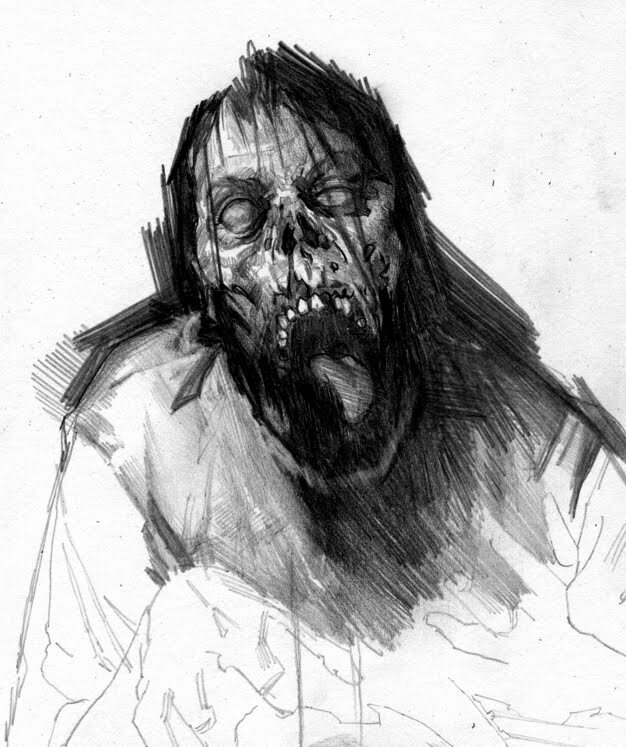 Here is the start to a sketch for a new zombie illustration. I made it about 1/3 of the way through the sketch before realizing the composition was a total failure. I liked the zombie design though so I thought I would post it. Keep an eye out for the final sketch in a couple days. I like it! Hardly a fail probably just not exactly what the brief/client requested/required. Explain why you think its a failure. Right now it looks like a portrait and I don't see a problem. ATOM and Matt- It was actually all my decision, I simply didn't do enough exploration through thumbnails. What you are seeing here is just a small portion of the image. Matt what you are saying is exactly the problem, it looks like a zombie portrait which is not what was right for the narrative/scene. What I had in mind is a bit moodier, which I thing I achieved in the second sketch. In a few days check back and tell me if you agree.